Patrick Kunz is the founder of Togu Audio Line and the developer behind countless much-loved freeware synths including TAL-NoiseMaker, TAL-BassLine and TAL-U-No-62. 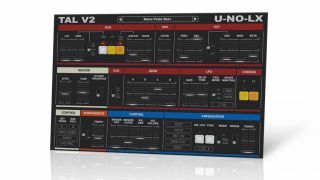 TAL recently released its first commercial in the form of TAL-U-NO-LX - a beefed-up version of the company's popular Juno-60 emulation. How did TAL get started? "TAL started around 2000. I always liked the sound of analogue synths, noisy effects and the idea of running plugins with that sound in a DAW. "My first plugins were simple waveshapers. After that, I started to make a simple synth that I never released. The first public plugin was mfilter, a simple 24dB multimode filter. "Pascal Deville, the owner of the domain corrupt.ch, supported me with a subdomain where I could publish my plugins and news. I never expected that anyone would use this plugin. The website was something like an education project. I don't know how, but people found my site and gave me feedback. This was the point I decided to make more plugins and share them on my site. That's how TAL started!" Why did you make so many freeware plug-ins? Which one of them has been the most popular? "I had a music project running (Kunz & Knobel) and I needed some plugins for it. I started to work on the TAL project after the company I worked for dismissed all its programmers, including me. "I programmed TAL-Vintager and TAL-U-NO-60 in this time. I started to use my plugins in my own music projects and it was really fun. I just programmed all the delays, reverbs and synths I missed by myself, and shared them with other people. Currently the most popular free plugin is TAL-NoiseMaker." Why make the move into commercial plug-ins with TAL-U-NO-LX? Was it something you planned to do all along? "It wasn't planned. People wanted a full featured Juno-60 emulation, including the arpeggiator and all those details. Most told me they'd pay for such a plugin. It was much more work making a commercial product than I thought. The difference between a freeware and commercial product is a lot of time if you want to make it serious." Is there still a market for emulations of classic kit? Do younger producers care about getting the sound of gear that's older than they are? "I know that a lot of people don't want emulations any more. Those old synths don't have all the features people need to make a dubstep sound in five minutes. But I think that a classic analogue synth is a good tool for authentic electronic sound. "I like the idea of starting with a raw sound you can shape as you want, and adding your own favourite high quality effects in the mixer. This gives you many more possibilities to be creative and make your own sound. It's hard work and not just preset switching, but I believe it's worth it." What's next from TAL? Will you make any more free plug-ins? Will you make any more commercial plug-ins? "I have planned to rewrite some older freeware plugins, like the Chorus-60, and make them OS X 64-bit compatible. There are also plans to add OS X VST 64-bit support to TAL-NoiseMaker. "I think that's enough work for the moment. I don't know what I'll do after that. It's possible that I'll make some more commercial products somewhere in the future."